In this Homecoming recap of season 1 episode 4, Shrier disappears, Thomas confronts Colin, and Walter and Heidi get closer. The Willy-Wonka-esque opening sequence reveals to us how the Geist “medication” is made. We see the harvesting of plants, revealing berries that are then processed in a lab into powder, then transformed into a bubbling liquid that is put into vials and finally packed into a box. Another very clever visual sequence shows us the box staying more or less stationary as the scenery changes around it. It goes to a cargo hold, to the back of a van, and to a mail cart going through an office – it’s final destination at the Homecoming project. We then see Walter looking into Shrier’s room, where they are packing up all his things. Walter goes to see Heidi and asks her why Shrier is gone when it was just as much his fault. They sit down for a session and Walter reveals a bit more about the circumstances surrounding Lesky’s death. Walter feels he is responsible. He also feels responsible for keeping those memories alive and that he needs to deal with that burden instead of letting it go. 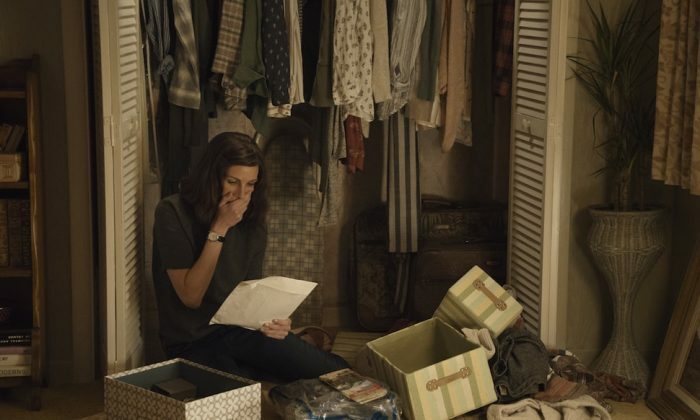 In 2022, Heidi is emptying boxes and searching for something in her closet. She finds a bag labeled “patient belongings.” There’s a phone and a map of California. She asks her mom why she didn’t tell her she was in the hospital and her mom doesn’t seem to understand her questions. “Tell you? You were there!” she exclaims. Thomas is walking through the Geist office building and we note that every department in the building is named after a tree: Dogwood, Willow, Elm. He finds “Redwood” and asks about talking to someone about Homecoming. He gets the runaround from the receptionist after being passed from one dept to another. She calls Colin and he comes out to talk to Thomas, but pretends he knows nothing. Thomas tells Colin he’s found a client of the program and will be talking to him. Colin looks down to see his shoelace untied… it’s all unraveling! Heidi goes to Walter and gives him Shrier’s harmonica. She notices the map of California on his wall. He tells her how he drove across country alone to get to Yosemite. But his car died right when he got there. A couple weeks later he was in basic training. He talks about being deployed and the pointlessness of it all. The whole conversation was so understated, yet so powerful. Julia Roberts and Stephan James are fantastic in this series. Walter hugs Heidi as she leaves. It looks awkward at first, but then they both melt into it. Back in 2022, Heidi’s friend at the diner convinces her to call Colin since his number comes up so many times on the old cell phone she found. He is totally shook and hangs up on her. Question: WHERE DO THE PLANTS COME FROM? * The episode title also connects to the map. What state is famous for having redwoods? * The chair in the Redwood section at Geist: Thomas sits down with expectations, that he will be supported. When he commits himself to it, the chair isn’t what he expected. It envelops him, and takes away power and agency. That’s how the Geist program (and Colin) treats everyone: setting false expectations, then removing ability to act on their own. Have you watched the other series that Sam Esmail created, “Mr. Robot”? If you’re a fan of the storytelling elements of Homecoming, then you will love his earlier show. Thanks for your comments, Tom! I love your take on the Redwood chair – that’s spot on. We’ll definitely mention your thoughts in our upcoming feedback episode!